Located in one of Dinwiddie County’s best kept secrets - desirable Waterford Landing - a waterfront subdivision on Lake Chesdin! Get ready to fall in love with the attention to detail & elegant touches! You will be immediately impressed by the exquisite landscaping on the 2.51 acre lot. If you love hardwood floors & crown moldings, you will not be disappointed as they can be found beginning with the foyer & throughout the house. Lovely dining room featuring a glamorous chandelier is the ideal backdrop for hosting formal parties. The chef in the family will love the expansive kitchen - breakfast bar with pendant lighting, ceramic tile backsplash, glowing granite counters, island, pantry & upgraded stainless steel appliances all come together to create a space that is both inviting & functional. 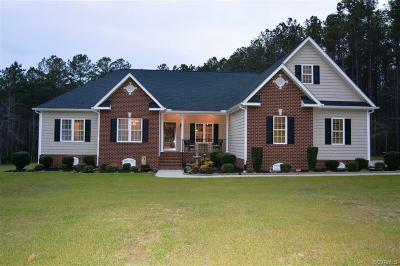 You will appreciate the large great room with its vaulted ceiling & cozy gas-log fireplace. Imagine retiring for the night to your gorgeous master bedroom and relish in the luxury of the spa-like en suite bath. Plenty of storage between the walk-in attic, oversized garage & space under the deck. This one-owner custom built prestigious home is as close to perfect as perfect can be!